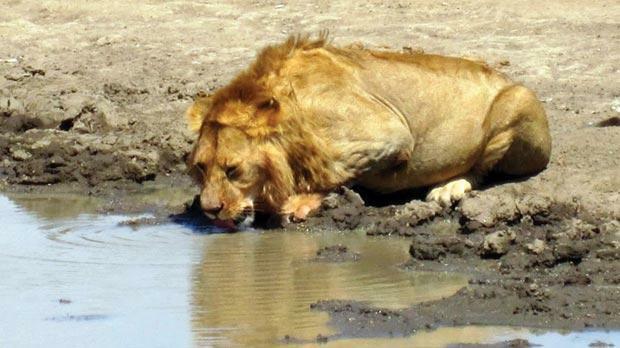 A lazy lion drinks from a watering hole, under the watchful gaze of dozens of tourists. 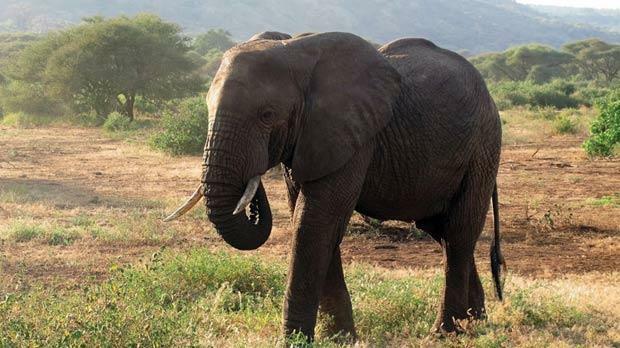 The elephant is the not-so-silent giant of the Sernegeti. The Serengeti. A name that sounds fictitious, invented by National Geographic to sell satellite subscriptions, or created by the imagination of Disney. Nobody even attempted to make it look believable, with aerial shots of a million wildebeest, talking warthogs, lions and crocodiles mauling zebras, and a hyena that sounded like Whoopi Goldberg. To me the Serengeti was The Lion King, make believe. Yet it gave me a chance for redemption. Three years earlier I’d dressed up as a giraffe at an animal-themed party, immersing myself in the challenge by relinquishing speech and improvising giraffe-type noises all night. I’d watched the documentaries beforehand, but the long-necked beast was always on mute, voiced-over by a narrator’s soothing cadence. Do you know what noise a giraffe makes? I didn’t, but 250 people have since believed it’s a cross between a constipated whale and a demented kitten. I was going undercover, infiltrating the mythical world, searching out the giraffes in their natural habitat so I could tell the world (or at least Malta) the truth. I’m outside the Serengeti park gate in Kenya, on safari with a cowboy tour company with the sub-Saharan experience of an emperor penguin. There’s a gang of baboons thumping through the car park and jumping on cars. Suddenly they’re behind me, two blurs of grey and black fur prizing the window open. I’m shooing them away and accepting the loss of a jam sandwich when another one gets in, the big daddy of all baboons, more a gorilla than a minor primate. No! Away from the chicken leg! The alpha male is showing the youngsters how it’s done, stealing the only luxury I had bought myself for three days camping in the bush: barbecue-flavoured Pringles. It begins. Every angle, forever and ever. Grass. With the eyes there is grass. With the binoculars only grass. Elegant zebras chomping the grass, gazelles skipping in the grass, warthogs snorting the grass for truffles, predators hiding in the grass, and our vehicle stopping in the grass. We’ve broken down in the middle of the Serengeti! They’re out there, lions and leopards, hiding in the grass, watching me and my guide, Mr Six, contemplate mechanics with a hammer. The zebras jump and the wildebeests follow, galloping away in a spell of dust as I move just as fast back into the car. Six hungry lions cross the road 20 metres away, roaming like drunkards searching for a bottle of cheap plonk. The vehicle stutters and limps away with tyres screeching. I have my head out of the roof, spotting three trusty necks that dominate the horizon, silent silhouetted sentinels… and we nearly crash into them as Mr Six chats on his phone. 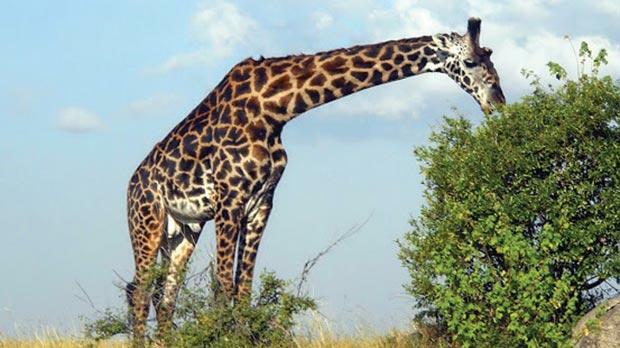 The giraffes turn slowly, delivering stares of contempt; upset mutes heading towards the foliage. What noise does a giraffe make, Mr Six? Mr Six employs the tried and trusted spotting tactic: scan for parked vehicles, accelerate towards them, and point the camera in the same direction as the other tourists. We see a pack of lions slurping at a watering hole; a lonely hyena scavenging; a leopard hiding behind a tree; elephants competing in the regional qualifying for world’s strongest trunk, uprooting trees like bulldozers on steroids. All magical scenes to savour, but they’ve already been discovered by someone else. Day two and more giraffes stay out of range and watch our movements with suspicion. But what noise do they make? I demand an answer from Mr Six. “They sound like a zebra crossed with a camel.” That can’t be true. Camels grunt. But zebras? Hesitantly I step out, walking waist-deep into the foliage. As I get within range, I perform star jumps to make myself look big and trick a 10,000-strong herd into thinking a large predator is approaching. That’s when I discover that a zebra sounds like a horse with hiccups. Day three and the scene is all mine: a leopard on the move under the veil of sunrise. It creeps slowly, sensing the gazelle, dipping its neck with cold precision. The spine follows as the spotted killer drops into the grass. No! This is my leopard! But the safari truck has stopped and another is following. They reach for their radios and ‘my leopard’ is soon surrounded by 15 vehicles. The gazelles sense something, jumping one way, darting a few steps to the other. Nobody stops for a gazelle. The punishment inflicted for accidently running an animal over is a telltale sign of its importance: gazelle $500 (€381) fine; zebra $2,000 (€1,526); lion – prison; leopard – life in prison. The gazelles want to run but every angle is filled by Americans trying to blend into the scenery by wearing wide-brimmed khaki hats and button-up khaki shirts tucked into ugly khaki zip-off trousers/shorts. They top it off with colossal khaki walking boots, even though leaving the vehicle is prohibited on safari. When we drive in the Serengeti we’re another moving predator, constantly on the lookout for action. We’re territorial, annoyed by the presence of others like us, wanting the prizes to be exclusive. Around the campsites we’re one of many beasts equal in the food chain, but the Serengeti is over 50 times the size of Malta, and when we drive into the infinite grass the landscape is transformed from common fiction into individual reality. But three days have gone and my question is unanswered. Becoming desperate, I’m stopping every land cruiser and asking every guide, every monstrosity of khaki, but the answers come in similes and maybes; perhaps a clicking noise, like a horse, possibly a chomping sound? One last chance. Two graceful giraffes dismiss our presence and trot away with confident poise. I keep staring as we drive off, three days in The Lion King, and the answer still eludes me. Was that? Surely not? It was. That giraffe turned and winked at me. It hits me. So obvious. Yet so easy to miss. They’ve been telling me all along. Approaching a Masai tribesman, I ask for confirmation. 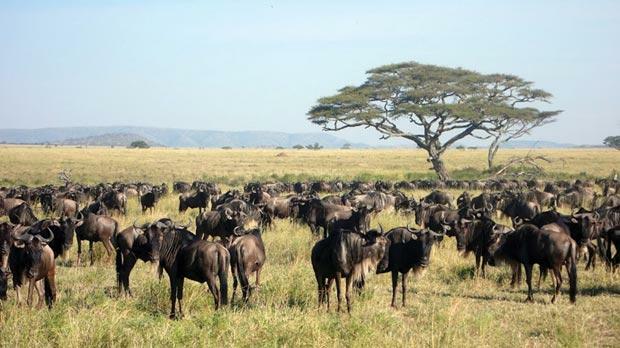 In the scramble to seek animals, in the madness of Mr Six’s driving, in the competition for unique sightings, I’d neglected what makes the Serengeti so special: serenity. And I realise that in the films and on the documentaries the Serengeti is fictional, a compilation of animated animal life filmed over months of frustration. Turn around Mr Six, I know where the Serengeti becomes non-fiction. And I know how to spend the final day: stopping in the middle of nowhere, watching the real animal world slowly go by.